Recently, there was an internal shift in the offices of Bryant Park Corporation HQ. I went from sitting in an open area, sort of a combo - cubicle/bullpen setting, to a room with four walls, a door, and two windows that actually open (rare for a midtown office building). Being able to somewhat control light and temperature levels and tell when it's dark outside is very nice. Like many working archivists, most of my former jobs took place in dreary basement-level rooms with poor air circulation (great when you are sorting through 30 year-old Thermofaxes layered in dust, or rotting photographs reeking of developing fixer solution) and no natural light. Now, I look out the window and see this building. The World's Tower, at 110 West 40th Street, between Sixth Avenue and Broadway, has 30 above-ground levels, and a glazed terra cotta facade. 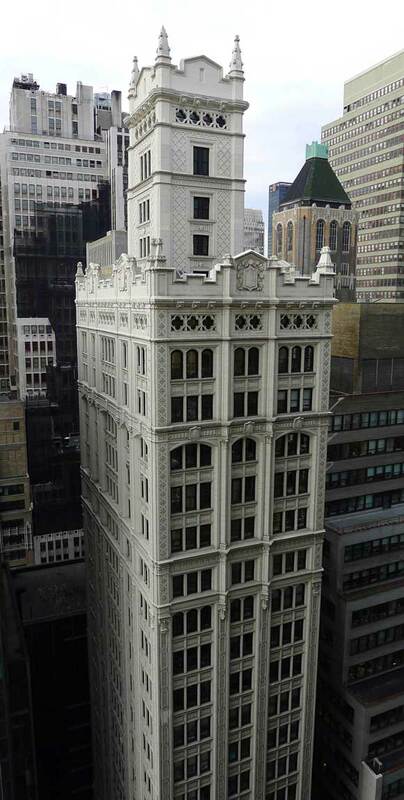 When this Neo-Gothic building was completed in 1913, it was the tallest of its kind, on an extremely narrow, 50 foot-wide footprint, and made a striking impression in mid-town Manhattan. 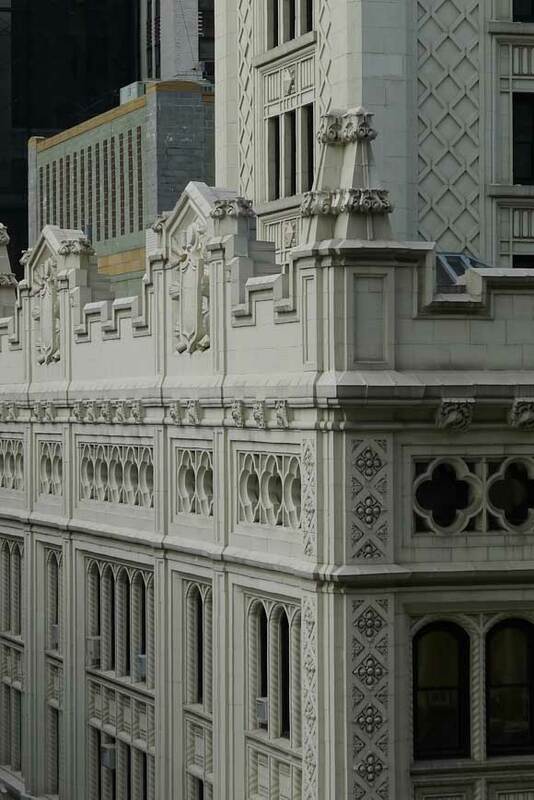 The architecture firm, Buchman & Fox, was commissioned by budding real estate magnate Edward W. Browning. According to New York Times Streetscapes columnist Christopher Gray, Browning was eccentric, throughout his life, steadily acquiring adoptive daughters (and marrying one), as well as skinny mid-block high-rises. You can also see part of the Empire (Eltinge) theater in the bottom right, with Billie Burke (later to play Glinda the Good Witch of the North in The Wizard of Oz) on the marquee. Behold, midtown, more or less as we know it now. 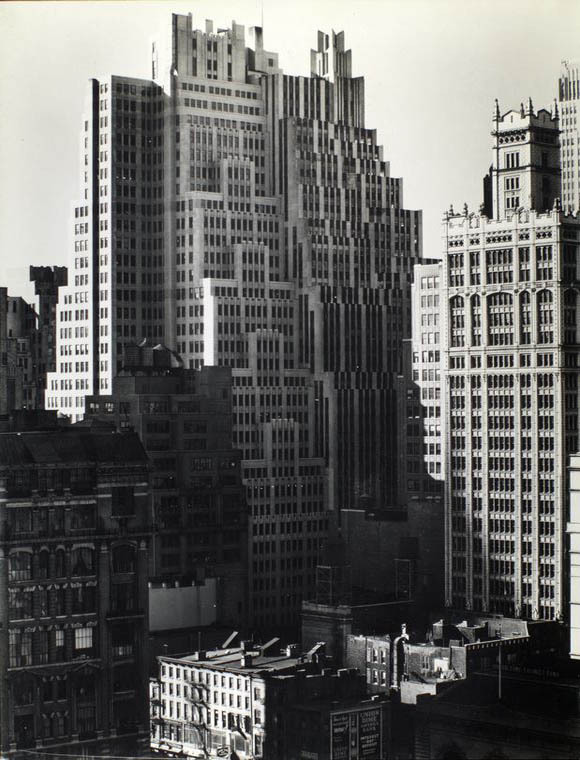 The above photograph, taken in 1935, and looking south-west above and across Bryant Park, shows numerous high-rise buildings surrounding the Tower. The Union Dime Savings Bank building is in the lower right of the above photograph, and Bryant Park is just west, outside the bottom frame of the photograph.